For the longest time, I have had the Creating Keepsakes fabric samples boxes from when I joined one of their clubs one time. I kept thinking there must be a way to use all these beautiful fabric samples. Yesterday, I made this simple greeting card on double folded card stock. The card size is approx 4.25 x 5.5 once I folded a simple 8.5 x 11 paper in half twice. 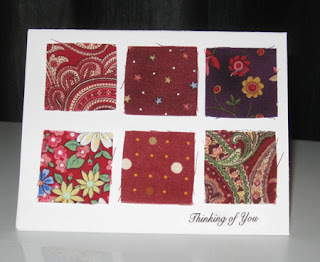 I simply used a bit of double sided tape on the center of each 1.5" fabric square and adhered them to the card stock. They are not completely taped down, just the centers. I printed out the small greeting on regular paper and used a glue stick to add it to the card. For some reason, I like the fibers coming off of each square. Now, based on the number of squares I have in these two boxes, I could be in greeting cards for a while. Very cute idea! And who wouldn't love to receive such a cute card?! :-) Have a great day!